The following is being reissued by the Monkeywrench Press in recognition of the sensational and pseudo intellectual portrayals of Anarchists and Anarchist ideas in the Media and Academia. This century old schlock has been causing readers to slap their knees since it's appearance in The Monist, vol. #1, (1891). All graphics and captions included are courtesy of Capt. 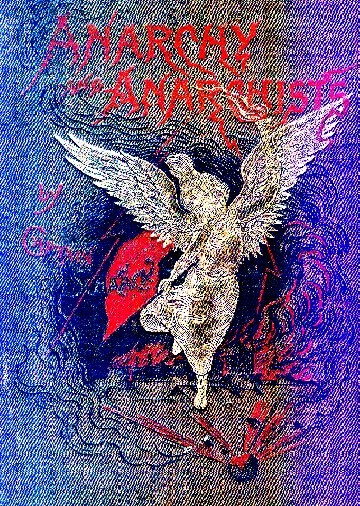 Schaack's, Anarchy and Anarchists" (Chicago, 1889) referred to in the article below. THE PHYSIOGNOMY OF THE ANARCHISTS. which hitherto seemed to escape all our researches, so completely that until now all jurists had ended by saying that there was no political crime; but it seems also to supply us with a method for distinguishing true revolution, always fruitful and useful, from utopia, from rebellion, which is always sterile. It is for me a thoroughly established fact, and one of which I have given the proofs in my "Delitto Politico," that true revolutionists, that is to say, the initiators of great scientific and political revolutions, who excite and bring about a true progress in humanity, are almost always geniuses or saints, and have all a marvelously harmonious physiognomy; and to verify this it is sufficient simply to look at the plates in my "Dellito Politico." What noble physiognomies have Apollo, Fabrizi, Dandolo, Moro, Mazzini, Garibaldi, Bandiera, Pisacane, la Petrowskaia, la Cidowina, la Sassulich! Generally we see in them a very large forehead, a very bushy beard, and very large and soft eyes; sometimes we meet with the jaw much developed, but never hypertropic; sometimes, finally, with paleness of the face (Mazzini, Brutus, Cassius) but these characteristics seldom accumulate in the same individual to the extent of constituting what I call the criminal type. In a study that I have made with three hundred and twenty-one of our Italian revolutionists. (against Austria etc.,) nearly all males,. there were twenty-seven women to one hundred men,) the proportion of the criminal type was 0.57 per-cent. ; i.e. 2 per cent. less than in normal men. Out of thirty celebrated Nihilists, eighteen have a very fine physiognomy, twelve present some isolated anomolies, two only present the criminal type (Rogagiew and Oklasdky), that is to say 6 -8 per cent. And if from these unfortunate men who represent to us, even psychologically, the Christian martyrs, we pass to the regicides, to the presidenticides, such as Fieschi, Guiteau, Nobiling, and to the monsters of the French Revolution of 1789, such as Carrier, Jourdan, and Marat, we there at once find in all, or in nearly all, the criminal type. And the type again frequently appears among the Communards and the Anarchists. Taking fifty photographs of Communards I have found the criminal type in I2 per cent. ; and the insane type in 10 per cent. Out of forty-one Parisian Anarchists that I have studied with Bertillon at the office of the police of Paris, the proportion of the criminal type was 31 per cent. In the rebellion of the 1st of May last I was able to study one hundred Turin Anarchists. I found the criminal type among these in the proportion of 34 per cent., while in two hundred and eighty ordinary criminals of the prison at Turin the type was 43 per cent. Among the 100 individuals arrested on the 1st of May, 30 per cent were recidivists for common crimes; among the others, 50 per cent. Of true prison habitues there were 8 among the former and 20 among, the latter. Thanks to the assistance of Dr. Carus of The Open Court Publishing Company, who has sent me many curious data and also the work, of Schaack, "Anarchy and Anarchists " (Chicago, 1889), which is very partial, although rich in facts, I have been able to study the photographs of 43 Chicago anarchists, and I have found among them almost the same proportion of the criminal type, that is 40 per cent. The ones that presented this type are the two Djeneks, Potoswki, Cloba, Seveski, Stimak, Sugar, Micolanda. Bodendick. Lieske, Lingg, Oppenheim, Engel and his wife, Fielden, G. Lehm, Thiele, and Most. Especially in Potowski, Sugar, and, Micolanda I mark facial asymmetry, enormous jaws. developed frontal sinus, protruding ears and the same (except the asymmetry) in Seveski and Novak. Fielden has a turned up nose and enormous jaws; Most has acrocephaly and facial asymmetry. On the contrary a very fine physiognomy has Marx, with his very full forehead, bushy hair and beard, and soft eyes ; and likewise Lassalle, Hermann, Schwab, the two Spies, Neebe, Schnaubelt, Waller, and Seeger. In studying the chief anarchists separately,--the martyrs of the Chicago anarchists, it might well be said,--there is found in them all an anomaly, very frequent in normal men as well; that is to say, the ears are without lobes ; the ears are also developed a little more than normally in all (except in Spies), they are protruding in Lingg, Fischer, and Engel; the jaw is much developed in Lingg, Spies, Fischer, and Engel; all have, however, except Spies [Thus according to the portrait in Schaack's book; but according to information which I later received from General Trumbull of Chicago, this portrait is not true to life. It would seem, then, that the features upon which my opinion is based do not exist], the forehead fine and full, with great intelligence. In the plates of the journal Der Vorbote we find a Mongolic cast of feature in Engel and Lingg, both of whom should have much of the degenerative characters, enormous jaw and zygoma, and Lingg oblique eyes. But these characters are much less apparent in the photographs that I received from The Monist and in which the jaw of Fischer even decreases. Perhaps these photographs were taken some years before the crime, when they were very young. Certainly in both instances (in the Vorbote and the photographs from The Monist) I find a very noble and truly genial physiognomy in Parsons and Neebe. The physiognomy of August Spies is morbid. He has a senile auricle, voluminous jaw bones and a strongly developed frontal sinus. And, it is necessary to remark, the physiognomy corresponds with his autobiography, written with a fierce fanaticism; whilst in the posthumous writings of Parsons and in the writings of Neebe we remark a calm and reflective enthusiasm. Fielden has a wild physiognomy, not without sensuality. Parsons resembles Bodio, the great Italian statistician, and in the upper part of the face, Stanley.